It is important to understand the rating by which bathroom and some outdoor lights are classified. IP rating stands for ‘Ingress Protection' and is always followed by two characters. The first of these two numbers refer to level of protection from foreign bodies entering the fitting. The second of the two numbers is the protection against water ingress, the higher the numbers the higher the protection. It is important that you choose fittings with the correct rating according to where they are to be installed within the bathroom. 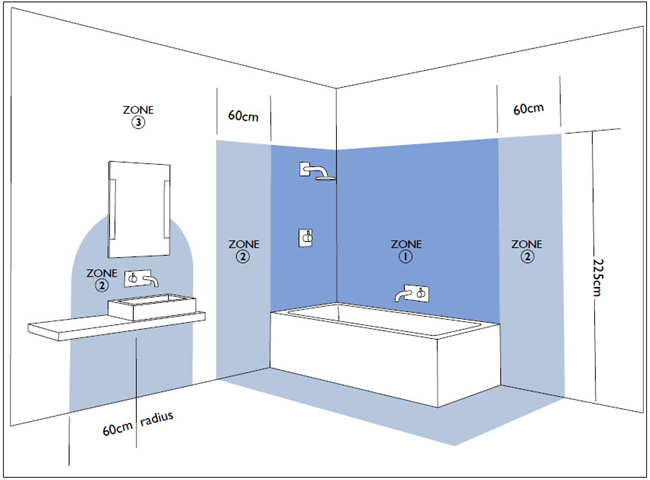 Zone O: The interior of bathtub or shower tray – IPX7 and low voltage supply (max 12 Volt). Zone 1: The Perimeter of bathtub or shower tray up to a height of 2.25 meter above the floor- IPX4 Use IPX5 where water jets are used for cleaning purposes. If the fitting is 240v a 30ma residual current device (RCD) must also be used to protect the circuit in this zone. Zone 2: The Perimeter 0.6 meter wide around Zone 1 and 0.75 meter above Zone 1 – IPX4. Use IPX5 where water jets are used for cleaning purposes. Zone 3: The Perimeter 2.4 meter wide around zone 2 and 0.75 meter above Zone 2 - Use IPX5 where water jets are used for cleaning purposes. Otherwise no specified IP rating required although lights should be suitable for their location and provide adequate protection against electric shock. IP rating means Ingress protection so basically how the light has been classed to stand up to solid objects and water ingress. The IP rating is quoted with 2 numbers after the IP, below is a full explanation of their meanings. 1: Protection from a large part of the body such as a hand (but no protection from deliberate access) from solid objects greater than 50mm diameter. 2: Protection against fingers or other object no greater than 80mm in length and 12mm in diameter.